Provincial Grand Master for the Province of Valencia. 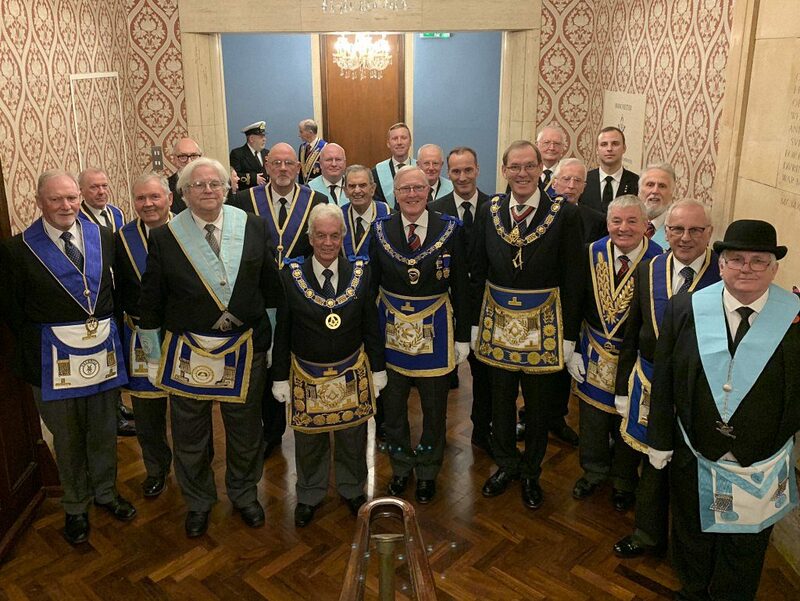 Caledonian Lodge No 204 hosted a very special Spanish themed event on Wednesday 14 November 2018, at Manchester Masonic Hall. 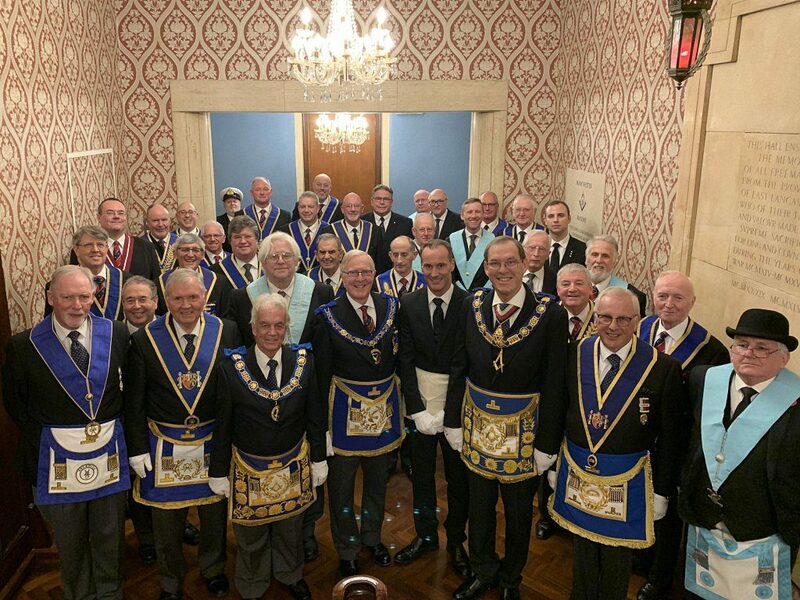 One might have been mistaken for thinking that the distinguished guests from the Grand Lodge of Spain were there in some official capacity, but no, they had all travelled to Manchester to witness the initiation into Freemasonry of Paul Mansell, son of RWBro Barrie R Mansell, Assistant Grand Master for the Grand Lodge of Spain. Once the lodge had been opened, WBro Jonathon Basger, Provincial Assistant Grand Director of Ceremonies, entered the lodge and announced that WBro Christopher Welton, Assistant Provincial Grand Master, was outside the lodge, accompanied by a delegation from the City Sykes and City Derby Districts, and that he demanded admission. The Assistant Provincial Grand Master and his delegation entered the lodge and once seated, the Worshipful Master offered him the gavel. On this occasion, he chose to decline his kind offer but continued to introduce his delegation which included: WBro Chris Prax, City Sykes District Chairman; WBro Chris Wildman, City Sykes Deputy District Chairman; WBro Paul O’Carroll, City Derby Deputy District Chairman; WBro Mel Rosenthal, City Derby District Secretary; WBro Elliott Moss, Manchester Districts Almoner; WBro Roy Chairman, City Sykes District Mentor; WBro Andrew Greenhalgh, Royal Arch District Officer; WBro Russell Conn, Royal Arch District Officer; WBro Chris Armstrong and WBro Craig Wood, both Provincial Grand Stewards. At this point in the ceremony, RWBro Barrie Mansell brought greetings from the Grand Lodge of Spain and introduced his most distinguished delegation, which included: RWBro Michael A Shilan, Provincial Grand Master for the Province of Valencia; VWBro Rodney C Bignall, Deputy Provincial Grand Master for the Province of Valencia; WBro Terrence Porter, Assistant Grand Director of Ceremonies and WBro Gordon Ramshead, Provincial Assistant Grand Director of Ceremonies for the Province of Valencia. and the Distinguished Guests from the Grand Lodge of Spain. 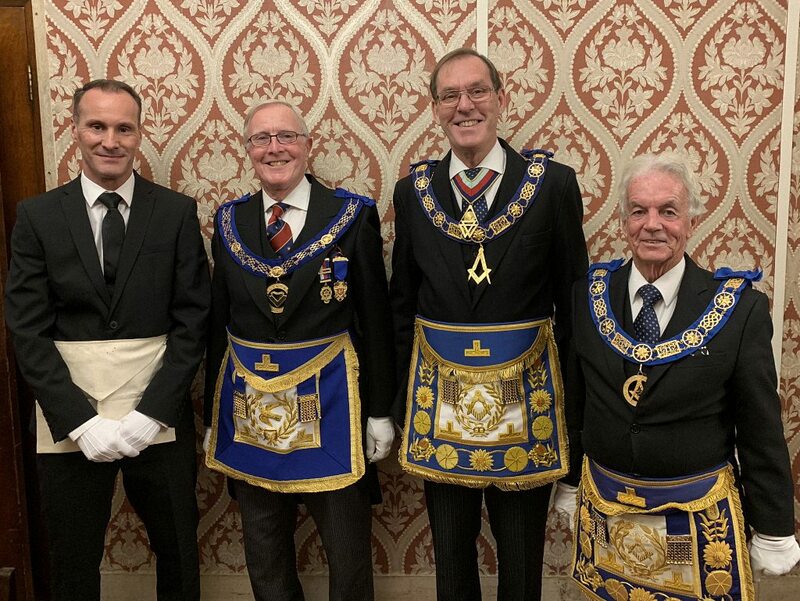 The ceremony of initiation was then performed perfectly by the Acting Worshipful Master, WBro Graham Alexander and the Officers of the Caledonian Lodge. Bro Paul Mansell and his father, RWBro Barrie Mansell, Assistant Grand Master for the Grand Lodge of Spain. It is a tradition within Caledonian Lodge that, at the meeting held closest to Remembrance Day, a Brother read the names of all those members of Caledonian Lodge that have risen to the Grand Lodge above, whilst in the service of their country. On this occasion, Bro Boyce-Thomson performed this duty and the brethren assembled observed a minute of silent reflection. 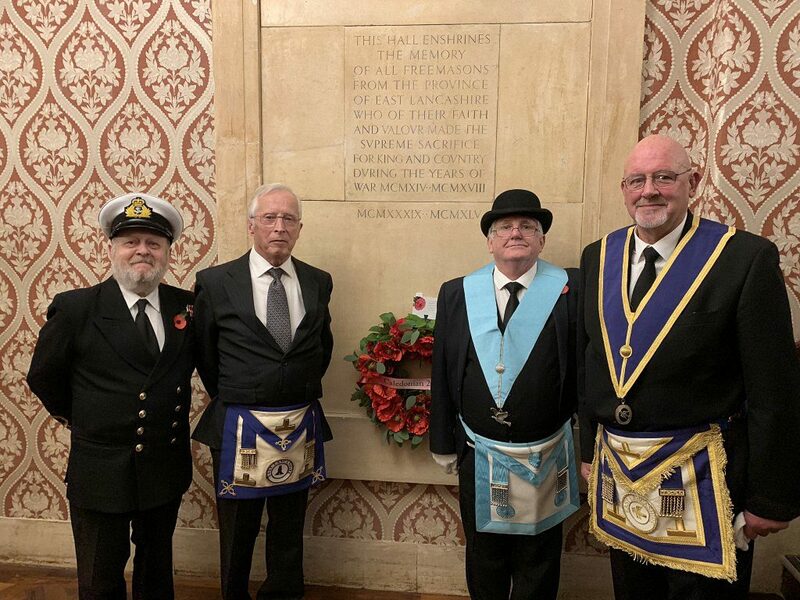 Once the lodge had been closed, Bro Bryce-Thomson led the Brethren in a procession to the Memorial Stone Plaque outside the Lodge Room and placed a commemorative wreath upon it. Caledonian Lodge had enlisted the assistance of a bugler and, before the Brethren retired for dinner, he played ‘The Last Post’. Members of Caledonian Lodge and their Bugler, stood in-front of the Memorial Stone Plaque. The Social Board was both fun and enjoyable. 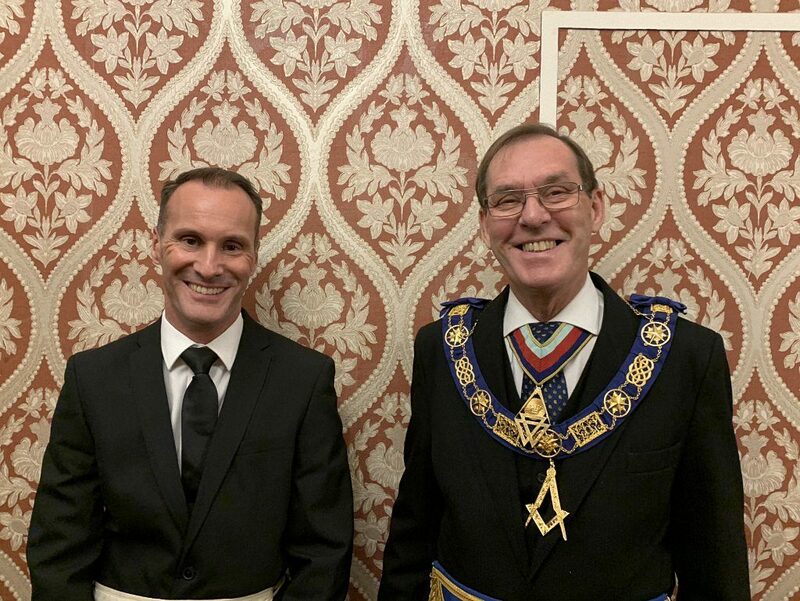 The Toast to the Candidate was given by his father, RWBro Barrie Mansell, during which he expressed the joy he felt at witnessing his son, now Bro Paul Mansell, being initiated into Freemasonry. Members of Caledonian Lodge, WBro Christopher Welton, and the Distinguished Guests from the Grand Lodge of Spain.